It happens to me from time to time, and I’m sure it has happened to many of you too. You’re sitting at one of the increasingly rare bars that allow smoking, enjoying a cigar, and suddenly you’re being harassed by an anti-tobacco zealot. Often they flap their hands around, pretending to cough as they wave smoke from their face. On rarer occasions they will confront you to loudly proclaim, “That stinks! Can’t you put it out?” They might even laughably suggest you are killing them or giving them lung cancer by smoking nearby. I write “laughably,” by the way, because even government studies suggest non-smokers need to live with smokers for decades before any measurable increased risk is detected. So a few seconds, hours, or even days adds virtually zero risk. But I digress. How to respond to such a person is not an easy question to answer. We cigar smokers are generally considerate people, so while telling them to buzz off with some choice words has its appeal, that’s not the route I usually take. Instead, I often just say sorry it offends you and go on smoking, or recommend a nearby bar that doesn’t allow smoking. If it’s not inconvienent for me I may even move to another part of the bar. After all, only with enough smoking will the government be able to pay for the SCHIP program. 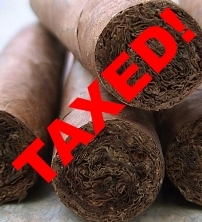 In fact, it is estimated that 22 million new smokers will be needed to fully fund the egregious scheme. That gets my vote for best post ever. Smokers are the most philanthropic Americans that ever existed, if not for tobacco tax nothing apparently would get done in this country. Congratulations on an absolutely brilliant post! Who do you think you are? Albert Einstein couldn’t come up with this… This post brings a tear to my eye. It’s for the children smokem if you gottem!! I bet you that those sanctimonious jerks who pester you for smoking will be left completely speechless when you use that line on them. Please share when you finally do get to use that line. I'm a UK reader where less than 0.1% smoke cigars and we pay a small fortune for cigars compared to the USA but I too smoke for my audience…… Cigars = relaxation = more space as others move further away. Pure genius. Can't wait to use this one!